Our women's gear and kit expert, Michelle Jana Chan, puts four of the best rucksacks for women to the test. The pressure for putting girls in pink begins early – in the baby department – but you might think it would halt at the entrance to the outdoor store. Alas, no. Not only are there fewer choices for women when it comes to adventure gear (due to lesser demand, it must be admitted) but the limited ranges come in a nauseating array of lurid colours. High-altitude jackets can be found in magenta or tourmaline, not the preference of some of the sporty women I know. A purple jacket is trimmed with pink zips. When I was seeking a down jacket to climb Aconcagua, I found one in mauve printed with silver snowflake motifs. I ended up buying a jacket from the men’s range, which came in a palette of tasteful bold colours (fiery red, royal blue, forest green) or neutrals (grey, black, navy). Perhaps the manufacturers have done more thorough research than I have, but asking around my women friends who hike and bike and climb and ski, everyone agreed that they did not want to carry a hot pink backpack or wear turquoise ski trousers. I would love to hear from any active women out there who have something to say about this. These gear and kit reviews will embrace women who are serious about having fun in the outdoors and this month I’m looking at women’s backpacks designed for multi-day hiking trips. Think about the length of the trip and the season of travel (cold, wet weather will require a bigger pack to accommodate bulkier clothing). 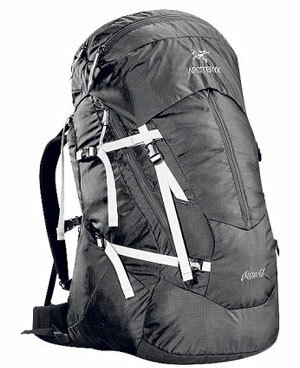 If you’re looking for an all-purpose rucksack, then 40-50 litres is a good catch-all size, depending on how you pack. The best way to find a good fit is to test out different packs at an outdoor store with a professional on hand to make technical adjustments. It is important to load a pack to see how weight is distributed. It is torso length, not overall height, that is the most important factor in finding a good fit – and the measurement that manufacturers use. That is the distance from your C7 vertebra (the most noticeable protrusion near the top of your spine) and the “shelf” of your hips, which can be measured with a soft tape. For Osprey pack users, the free “Osprey PackSizer” app can analyse your full-length photo and match your frame to an ideal rucksack. Women-specific backpacks conform to a classic female frame with shorter and narrower torso dimensions, which work well for some figures. Other women may prefer a men’s backpack, especially as some men’s packs have better features. Waist size is also important because the bulk of a pack’s weight, up to 80 per cent, is supported by the hips. The key measurement is around the top of the hips. Find a pack with a waistbelt that contours to your individual dimensions and form. This is down to personal preference. Some prefer a streamlined pack while others like numerous pockets, tool loops and fixing points. Some like hydration packs (in an internal or external sleeve) and others prefer to use water bottles, best stored in easy-to-grab side pockets. Some rucksacks come with an integrated rain cover but these are often not as sturdy as those you can buy separately. Arc’teryx make a cover with an elastic drawcord and compression straps which still provides easy top access (£25). That said, I use the cheap, effective alternative of a black bin bag with strategically torn holes to pass the straps through. My four recommended packs vary in size from 40 to 50 litres, and in price from £95 to £180. Brand is probably the most important influence on price but size, material and finish also have a bearing. The best deals may be found online but the benefit of buying in store is that a professional can fit the pack to your frame. A neatly shaped lightweight pack with great support and suspension, thanks to multiple adjustment devices and a big Velcro pad to fine-tune torso fit. The articulated harness and waistbelt are comfortable but not bulky and keep the load close to your body yet it maintains good ventilation with its mesh back panel. There is traditional top access to the main compartment as well as zippered access at the base, plus a stretchy mesh kangaroo pocket for a wet jacket. The hydration pack sleeve is sensibly external. The dual mesh side pockets are very deep, so items will be secure but may also be tricky to access. 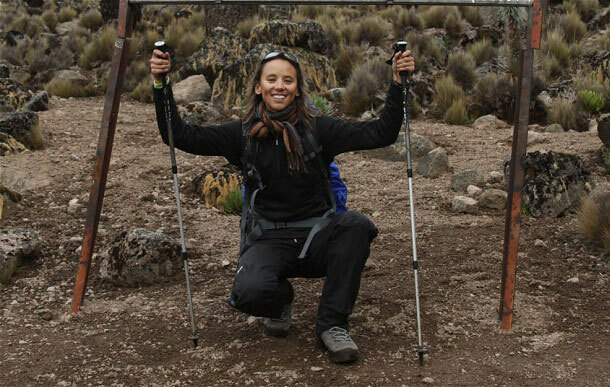 There are also dual mesh zipped pockets on the waistbelt, and a smart but simple system for attaching trekking poles using two elasticated loops. This well-priced, well-thought-out pack is my favourite of the ones tested and works perfectly for efficient packers. A classic high-quality trekking pack with an aluminium frame distributing the load well. The Velcro-adjustable system accurately tunes to torso length and a well-cut waistbelt takes the weight off the shoulders. The harness is cleverly designed to curve around a woman’s chest area (instead of squashing it) but some may find the thick foam to be bulky. A drawcord collar expands the pack significantly and there is a zippable compartment for your sleeping bag. The detachable top lid has pockets on the inside and outside but this section is awkward to fill because of its snug fit over the pack. On the front is an elastic cord system for a wet jacket and multiple lashing points. The hydration pack sleeve is external, which separates it from the rest of your gear in case of leakage. The stretchy side pockets offer “grab-and-go” access from the top and side of the rucksack. 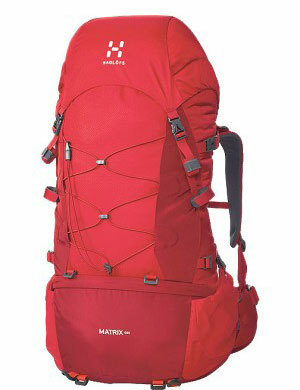 A conventional design that feels strong, durable and roomy, but it is also the heaviest pack among the rucksacks tested. A well-planned pear-shaped women’s rucksack with twin aluminium stays on its back that keep the pack close to the body, minimising load movement and backward pull. It has multiple adjustable features, from a contoured harness and waistbelt to a removable sternum strap, to change the fit. This pack feels spacious with its extendable drawcord collar. The main compartment of the rucksack can also be accessed from a zipper on both the left and right sides. There is a large internal security pocket and a kangaroo pocket for wet weather gear. The removable top lid has two zippered compartments accessed from the top (a good design, as it would be awkward to have one on the inside). Unusually, the dual side pockets are zippered, which may not suit everyone, especially those who like to grab a water bottle in one simple move. The hydration pack sleeve is internal which does pose a risk of leakage into the main compartment. 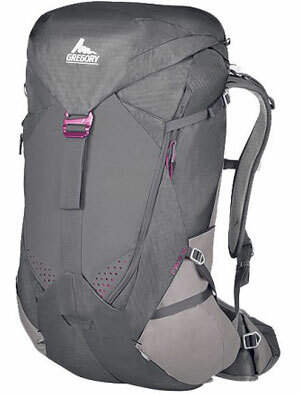 This is a comfortable pack with smart suspension and attention to detail – but it is expensive. The women-specific sculpted design of this rucksack features a wishbone internal wire frame which is flexible yet remarkably sturdy, and it also comes with a ventilated back panel. This brand goes its own quirky way and for the most part succeeds. For example, the lid has a single anodised aluminium hook instead of the more typical pair of plastic clips. There are unusual features such as the internal hydration pack sleeve which is accessed externally behind the back panel. The top-loading main compartment has front zipper access on one side; there are dual side pockets and dual waistbelt pockets; a kangaroo pocket can stretch to store a bike helmet, and stuffed behind this is an integrated rain cover. 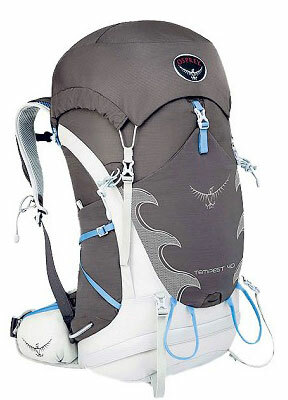 This is a pioneering pack with some unique designs from pockets to fastenings, which some may find refreshing and others may resist.